Stockport is seven miles out of Manchester or just seven minutes away on the fast train from Piccadilly Station. Stockport has its fair share of unique and landmark buildings from the contemporary blue glass pyramid, overlooking the M60, to the iconic 1930s Plaza Super Cinema and Variety Theatre. Manchester is a hotbed for events and entertainment. With four main theatres offering touring and local productions, four cinemas screen something like 40 films a day, lots of live music venues featuring everything from Folk to Rock, even Jazz, and clubs to dance the night away. So there is plenty to keep you busy all day or night. The centre of Manchester is not that big, but Greater Manchester stretches out a long way. The city’s trains, trams and bus networks will transport you about with simple ease. We strongly recommend that you check out the FREE bus routes servicing the centre; no.’s 1, 2 and 3. We set out to create a comprehensive and easy-to-follow guide about all things Manchester. The outcome intends to give insight into the city‘s best bits - from food and drink to sport and popular attractions. All the hard work has been for your benefit - just so you can explore the sights, savour the city, and Unlock Manchester yourself. 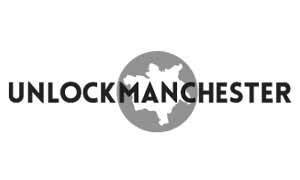 Manchester hosts about 9.2 million visitors and Unlock Manchester is designed to reach that audience and appeal to residents and city workers alike. Our FREE guides are in hotel rooms across the city and our Pocket Guide is in the city’s public magazine racks.